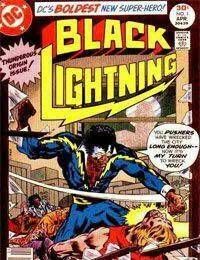 The origin of Black Lightning starts as many other superheroes do with a tragic murder. Black Lightning is a teacher at Garfield High when he crosses some drug dealers who retaliate and end up killing a young talented teenager by the name of Earl Clifford. This puts Jefferson Pierce on the path of becoming Black Lightning. With the help of a humble Tailor, Peter Gambi makes his costume and the Black Lightning is born. Black Lightning goes after the ones responsible until he comes to the thug Joey Toledo and gives him the ultimatum of turning him and his cohorts in or facing Lighting himself. Joey not one to turn rat is going to set up an ambush and put an end to the career of a new superhero.